The Earth usually falls into three of the four types of astronomical objects: gaseous, liquid, and rocky. This lecture looks at the rocky object: Earth. In addition to the Moon, there are Near-Earth objects (NEOs) that orbit the Earth briefly such as 1999 JM8 and 2006 RH120. (53319) 1999 JM8 is an asteroid, slow rotator and tumbler, classified as a near-Earth object and potentially hazardous asteroid (PHA) of the Apollo group, approximately 7 kilometers (4 miles) in diameter, making it the largest PHA known to exist. It was discovered on 13 May 1999, by Lincoln Near-Earth Asteroid Research at the Lincoln Laboratory's Experimental Test Site near Socorro, New Mexico. Its orbit has an eccentricity of 0.64 and an inclination of 14° with respect to the ecliptic. The body's observation arc begins with its first identification as 1990 HD1 at Palomar Observatory in April 1990, more than 9 years prior to its official discovery observation at Socorro. In the SMASS classification and Tholen classification, 1999 JM8 is an X-type asteroid. It has also been characterized as a carbonaceous C-type asteroid, which seems more likely due to its exceptionally low albedo. Radar imaging by Goldstone and Arecibo observatories revealed that 1999 JM8 has an unusually slow and possibly chaotic rotation period, similar to that of asteroid 4179 Toutatis. In July 1999, a rotational lightcurve of 1999 JM8 was obtained from photometric observations that gave a period of 136±2 hours with a brightness amplitude of 0.7 magnitude (LCDB quality code of U=2), and suggests that the body is in a non-principal axis rotation, commonly known as tumbling. 1999 JM8 measures between 5 and 7 kilometers in diameter and its surface has an exceptionally low astronomical albedo of 0.02. The Collaborative Asteroid Lightcurve Link derives an albedo of 0.03 and adopts a diameter of 7 kilometers based on an absolute magnitude of 15.2. Overview of the Cryosphere and its larger components, from the UN Environment Programme Global Outlook for Ice and Snow. Credit: . Earth's northern hemisphere includes with sea ice. Credit: NASA/Goddard Space Flight Center. Satellite composite image shows the ice sheet of Greenland. Credit: NASA. A satellite composite image shows a global view of the sea ice and ice sheet of Antarctica. Credit: NASA Scientific Visualization Studio Collection. This is a Landsat 7 image of the Himalayas. NASA. The only current ice sheets are in Antarctica [second image on the right] and Greenland [the first image on the left]; during the last glacial period at Last Glacial Maximum (LGM) the Laurentide ice sheet covered much of North America, the Weichselian ice sheet covered northern Europe and the Patagonian Ice Sheet covered southern South America. Shown in the northern hemisphere images is the rock distribution of sea ice and ice sheets [first image on the right]. At the right is a satellite composite image of the ice sheet over Greenland. At the south pole, Antactica, there is also an extensive ice sheet [second image on the right]. Apparently, when the North polar sea ice and ice sheet has been contracting, the South polar sea ice and ice sheet has been expanding. Often called the third pole, the third image on the right shows the rocky ice sheet over the top of the Himalayas. This is a view of the first high-temperature vent (380 °C) ever seen by scientists during a dive of the deep-sea submersible Alvin on the East Pacific Rise (latitude 21° north) in 1979. Credit: Dudley Foster, RISE expedition. The first image on the right shows Mount Redoubt in Alaska erupting on April 21, 1990. The mushroom-shaped plume rose from avalanches of hot debris that cascaded down the north flank. The second image is a view of the first high-temperature vent (380 °C) ever seen by scientists during a dive of the deep-sea submersible Alvin on the East Pacific Rise (latitude 21° north) in 1979. "In 1977, scientists discovered hot springs at a depth of 2.5 km, on the Galapagos Rift (spreading ridge) off the coast of Ecuador." "Such geothermal vents--called smokers because they resemble chimneys--spew dark, mineral-rich, fluids heated by contact with the newly formed, still-hot oceanic crust. This photograph shows a black smoker, but smokers can also be white, grey, or clear depending on the material being ejected." The image shows a portion of the San Andreas Fault in California USA on Earth. Credit: Robert E. Wallace, USGS. The image on the right shows a portion of the San Andreas Fault in California USA on Earth. Def. a "fracture in a rock formation causing a discontinuity" is called a fault. This detailed astronaut photograph depicts the summit caldera of the Mount Tambora. Credit: NASA ISS Expedition 20 crew. The crater in Santa Ana Volcano is photographed from a United States Air Force C-130 Hercules flying above El Salvador. Credit: 1LT José Fernández, U.S. Air Force. The view is into Karthala volcano crater in November 2006 at the solidified lava lake Credit: alKomor.com. S P Crater is a cinder cone volcano in the San Francisco volcanic field. Credit: . The first image at right is a "detailed astronaut photograph [that] depicts the summit caldera of the volcano. The huge caldera—6 kilometers (3.7 miles) in diameter and 1,100 meters (3,609 feet) deep—formed when Tambora’s estimated 4,000-meter- (13,123-foot) high peak was removed, and the magma chamber below emptied during the April 10 eruption. Today the crater floor is occupied by an ephemeral freshwater lake, recent sedimentary deposits, and minor lava flows and domes from the nineteenth and twentieth centuries. Layered tephra deposits are visible along the northwestern crater rim. Active fumaroles, or steam vents, still exist in the caldera." "On April 10, 1815, the Tambora Volcano produced the largest eruption in recorded history. An estimated 150 cubic kilometers (36 cubic miles) of tephra—exploded rock and ash—resulted, with ash from the eruption recognized at least 1,300 kilometers (808 miles) away to the northwest. While the April 10 eruption was catastrophic, historical records and geological analysis of eruption deposits indicate that the volcano had been active between 1812 and 1815. Enough ash was put into the atmosphere from the April 10 eruption to reduce incident sunlight on the Earth’s surface, causing global cooling, which resulted in the 1816 “year without a summer.”"
At right is the crater in Santa Ana Volcano is photographed from a United States Air Force C-130 Hercules flying above El Salvador. A volcanic crater is a circular depression in the ground caused by volcanic activity. It is typically a basin, circular in form within which occurs a vent (or vents) from which magma erupts as gases, lava, and ejecta. A crater can be of large dimensions, and sometimes of great depth. During certain types of climactic eruptions, the volcano's magma chamber may empty enough for an area above it to subside, forming what may appear to be a crater but is actually known as a caldera. In the majority of typical volcanoes, the crater is situated atop the mountain formed from the erupted volcanic deposits such as lava flows and tephra. Volcanoes that terminate in such a summit crater are usually of a conical form. Other volcanic craters may be found on the flanks of volcanoes, and these are commonly referred to as flank craters. Some volcanic craters may fill either fully or partially with rain and/or melted snow, forming a crater lake. The second image at right shows a solidified lava lake that composes the floor of the Karthala volcano crater. Phreatic eruptions typically include steam and rock fragments; the inclusion of lava is unusual. The temperature of the fragments can range from cold to incandescent. If molten material is included, the term phreato-magmatic may be used. These eruptions occasionally create broad, low-relief craters called maars. S P Crater is a cinder cone volcano in the San Francisco volcanic field, 25 miles (40 km) north of Flagstaff, Arizona. It is surrounded by several other cinder cones which are older and more eroded. It is a striking feature on the local landscape, with a well-defined lava flow that extends for 7 kilometers (4.3 mi) to the north. S P Crater is a 820 foot high cinder cone of basaltic andesite. The cone is capped by an agglutinate rim that helps to protect its structure. A lava flow extends to the north of the cone for ~7 km and originated from the same vent. Some workers consider the lava flow to have slightly predated the cinder cone because of geochemical data that suggests the flow is more silica rich than the cinders and based on the observation that the cone overlaps the lava flow and shows no sign of deformation. However, there is some debate about the relationship between the cone and flow as it is not uncommon to form cinder cones during the early phase of an eruption as a magma degasses, and then to have lava push through the side of a cone during a late phase of eruption. K/Ar dates on the lava are ~ 70 ka, but are considered unreliable because of excess Ar and the un-weathered young appearance of the cone. "Independently of other criteria the distribution of the KIT boundary ejecta predicts that the Chicxulub crater is the K/T source crater." "In agreement with many authors (Pal et al., 1982; Klein and Middleton, 1984; Blum et al., 1992), we therefore exclude meteoritic and lunar material as sources for the 10Be in the Australasian tektites, and, by a short extension, for virtually all the other atoms in the tektites." This satellite photograph is of the summit caldera on Fernandina Island in the Galapagos archipelago. Credit: . Mt.Pinatubo is in the Philippines. Credit: . Crater Lake, Oregon, formed around 5,680 BC. Credit: . Aniakchak-caldera, Alaska shows a characteristic caldera. Credit: . A caldera is a cauldron-like volcanic feature usually formed by the collapse of land following a volcanic eruption. They are sometimes confused with volcanic craters. The word comes from Spanish caldera, and this from Latin CALDARIA, meaning "cooking pot". In some texts the English term cauldron is also used. This is a map of the Pacific Ocean basin. Credit: National Geographic Society. This is a map of the Indian Ocean floor. Credit: National Geographic Society. This is a map of the Atlantic Ocean floor. Credit: National Geographic Society. This map shows the Southern Ocean floor around Antarctica. Credit: National Geographic Society. Although the map shows disputed areas, it also shows the Arctic Ocean floor. Credit: National Geographic Society. Centered above is the basin underneath the Pacific Ocean. Just below it is the geographic feature map for the floor of the Indian Ocean. Off on the right is the sea floor of the Atlantic Ocean. And, on the left is the basin around Antarctica of the Southern Ocean. At the bottom is the basin of the Arctic Ocean. This rotating globe shows the ocean floor obtained by a variety of geophysical techniques. Credit: National Geophysical Data Center, NOAA. The image at right shows what the Earth looks like topographically under the water cover that constitutes more than 50 % of the Earth's actual surface. Based on this sea floor topography, the Earth is a rocky object to depths much less than its radius. Landsat captures an image of Lake Toba, on the island of Sumatra, Indonesia. Credit: . Rubble mound, or dome, formed by the Operation Whetstone Sulky explosion. Credit: . This is an image of Panum Crater with its central lava dome, Mono Craters, California, USA. Credit: USGS. A resurgent dome forms the island of Samosir within the caldera of Lake Toba. The image at the left. It is 100 km/62 mi long and 30 km/19 mi wide, a caldera of the world's largest class. When the material above the explosion is solid rock, then a mound may be formed by broken rock that has a greater volume [as in the image of the Whetstone explosion area at the right]. This type of mound has been called "retarc", "crater" spelled backwards. "The name Panum Crater refers to a crater surrounded by [an] ejecta ring, with a dome in the middle. At Panum Crater [image at the second right] the dome didn't completely fill the crater or overrun the ring (as often happens) providing an opportunity to explore all three structures." "At Panum, a pyroclastic eruption (new magma explosively fragmented into the air) followed the phreatic (steam) eruption. During a pyroclastic eruption, the gas within the magma continues to expand and escape as the magma is thrown into the air and cools. The resulting deposits included ash (particles <2mm in size) and pumice. The pumice is frothy preserving the frozen gas bubbles." "The ejecta ring is made up of small bits of pumice, ash, obsidian fragments, and well-rounded granitic pebbles (which were part of the surrounding rock and not formed during the eruption) that were ejected during the final explosive stage of the eruption." "The central lava dome was erupted from degassed material and is made up of pumice and obsidian of the same composition. The difference between the two has to do with gas escaping as the magma cooled. The magma that created the dome had dissolved gas in it, like a bottle of seltzer water. As the magma rose towards the surface where there was less pressure on it than at depth, the gas expanded producing the holes (bubbles) you see in the pumice. The magma that remained pressurized while it cooled quickly or that had already lost its gas, formed the obsidian." "Flow banding containing both obsidian and pumice is common at Panum Crater. Another common texture, called breadcrust, can also be seen in the dome. Breadcrust textures form when the inside of a cooling rock is still hot with gas escaping from it while the outside surface has already cooled. As the gas expands from the inside, the outside surface cracks to allow the gas to escape." This image shows the crater created by the Sedan shallow underground nuclear test explosion. Credit: National Nuclear Security Administration, Federal Government of the United States. This diagram depicts a stylized cross-section of a crater formed by a below-ground explosion. Credit: JBel. Post-shot subsidence crater and Operation Tinderbox Huron King test chamber is from an explosion of less than 20 TNT equivalent kilotons (1980). Credit: . Sub-Level Caving Subsidence reaches surface at the Ridgeway underground mine. Credit: Rolinator. This is the gorge where the Reka River disappears underground. Credit: Dennis Tang from London, UK. A photograph shows a collapsed mine tunnel to the west of № VI Conow adit. Credit: Bernd Triller, Bergamt Stralsund; Recherche:Berginspektor. This image is an oblique aerial photo of Makhtesh Hazera. Credit: N. Fruchter, A. Matmon, Y. Avni, and D. Fink. The image at right shows the crater created by the Sedan shallow underground nuclear test explosion. At left is a stylised cross-section of a crater formed by a below-ground explosion. The relative importance of the five processes varies depending on the height above or depth below the ground surface at which the explosion occurs, and the material composing the ground. 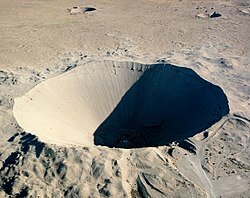 A subsidence crater is a hole or depression left on the surface of an area which has had an underground (usually nuclear) explosion. Subsidence craters are created as the roof of the cavity caused by the explosion collapses. This causes the surface to depress into a sink (which subsidence craters are sometimes called). It is possible for further collapse to occur from the sink into the explosion chamber. When this collapse reaches the surface, and the chamber is exposed atmospherically to the surface, it is referred to as a chimney. When a drilling oil well encounters high-pressured gas which cannot be contained either by the weight of the drilling mud or by blow-out preventers, the resulting violent eruption can create a large crater which can swallow up a drilling rig. This phenomenon is called "cratering" in oil field slang. Removal of material and rock beneath a surface may result in a collapse of material above into the cavern below. "In accordance with its definition, a makhtesh (Hebrew for "mortar" or "crater"; plural, makhteshim) is an erosion structure incised into an anticline and having a single drainage system with one outlet." "Erosional craters (Makhtesh) were formed by truncation and erosion of several of these anticlinal crests." At lower left, the image is an oblique aerial photo of Makhtesh Hazera. The Makhtesh drainage divide is outlined by a bold black line, with both of its constituent features (the anticlinal valley and the Upper Basin) located. A laboratory simulation of an impact event and crater formation is shown. Credit: . Impact crater structure is diagrammed. Credit: . Close-up of shatter cones developed in fine grained dolomite from the Wells Creek crater, USA, are shown. Credit: . U.S. Geological Survey aerial electromagnetic resistivity map of the Decorah crater has been produced. Credit: . The image shows a crater produced by missile impact in silty sand and sandy silt, oblique view. Credit: US Army. In the broadest sense, the term impact crater can be applied to any depression, natural or manmade, resulting from the high velocity impact of a projectile with a larger body. In most common usage, the term is used for the approximately circular depression in the surface of a planet, moon or other solid body in the Solar System, formed by the hypervelocity impact of a smaller body with the surface. In contrast to volcanic craters, which result from explosion or internal collapse, impact craters typically have raised rims and floors that are lower in elevation than the surrounding terrain. Impact craters range from small, simple, bowl-shaped depressions to large, complex, multi-ringed impact basins. Meteor Crater is perhaps the best-known example of a small impact crater on the Earth. Impact cratering involves high velocity collisions between solid objects, typically much greater than the velocity of sound in those objects. Such hyper-velocity impacts produce physical effects such as melting and vaporization that do not occur in familiar sub-sonic collisions. On Earth, ignoring the slowing effects of travel through the atmosphere, the lowest impact velocity with an object from space is equal to the gravitational escape velocity of about 11 km/s. The fastest impacts occur at more than 80 km/s in the "worst case" scenario which the asteroid hits the earth in a retrograde parabolic orbit (because kinetic energy scales as velocity squared, earth's gravity only contributes 1 km/s to this figure, not 11 km/s). The median impact velocity on Earth is about 20 to 25 km/s. Buried craters can be identified through drill coring, aerial electromagnetic resistivity imaging, and airborne gravity gradiometry. At right is a "[r]ecent airborne geophysical surveys near Decorah, Iowa [which is] providing an unprecedented look at a 470- million-year-old meteorite crater concealed beneath bedrock and sediments." "Capturing images of an ancient meteorite impact was a huge bonus," said Dr. Paul Bedrosian, a USGS geophysicist in Denver who is leading the effort to model the recently acquired geophysical data. "These findings highlight the range of applications that these geophysical methods can address." "In 2008-09, geologists from the Iowa Department of Natural Resources' (Iowa DNR) Iowa Geological and Water Survey hypothesized what has become known as the Decorah Impact Structure. The scientists examined water well drill-cuttings and recognized a unique shale unit preserved only beneath and near the city of Decorah. The extent of the shale, which was deposited after the impact by an ancient seaway, defines a "nice circular basin" of 5.5 km width, according to Robert McKay, a geologist at the Iowa Geological Survey." "Bevan French, a scientist the Smithsonian's National Museum of Natural History, subsequently identified shocked quartz - considered strong evidence of an extra-terrestrial impact - in samples of sub-shale breccia from within the crater." "The recent geophysical surveys include an airborne electromagnetic system, which is sensitive to how well rocks conduct electricity, and airborne gravity gradiometry, which measures subtle changes in rock density. The surveys both confirm the earlier work and provide a new view of the Decorah Impact Structure. Models of the electromagnetic data show a crater filled with electrically conductive shale and the underlying breccia, which is rock composed of broken fragments of rock cemented together by a fine-grained matrix." "The shale is an ideal target and provides the electrical contrast that allows us to clearly image the geometry and internal structure of the crater," Bedrosian said. The image at the right shows a crater produced by missile impact in silty sand and sandy silt photographed in an oblique view. The "[m]issile traveled along an oblique trajectory, 45.8° from the horizontal with a kinetic energy of 25.1 x 1014 ergs. The crater, about 6 metres across, and ejecta have bilateral symmetry because of the oblique trajectory. [The t]race of path of [the] missile is shown by [the] arrow. Small depressions in foreground are footprints." "Craters in natural materials at White Sands Missile Range, N. Mex., were produced by the impact of high-velocity to hypervelocity missiles traveling along oblique trajectories with kinetic energies between 2.1 and 81 x 1014 ergs. The oblique impacts produce craters 2 to 10 m across with morphologies and ejecta that are bilaterally symmetrical with respect to the plane of the missile trajectory. Rims are high and the amount of ejecta large in down-trajectory and lateral directions, whereas rims are low to nonexistent and ejecta thin to absent up-trajectory. Symmetry development and modifications of the symmetry are a function of target material, local topography, and angle of impact." This is Bedmap2 data of Antarctica’s bedrock with a 17x vertical exaggeration. Credit: NASA/GSFC. The Earth has an outer silicate solid crust, a highly viscous mantle, a liquid outer core that is much less viscous than the mantle, and a solid inner core. The Inner Core of the earth is believed to be composed primarily of a nickel-iron alloy, with very small amounts of some other elements. The Outer Core of the earth is a liquid layer made of iron and nickel. "A new dataset called Bedmap2 gives a clearer picture of Antarctica from the ice surface down to the bedrock below." The hominins of Earth may have observed and recorded a genealogy, or a begetting, of astronomical objects. Such a begetting may be called an astrogony. Their astronomical observations may have suggested a genealogy, a progression from one astronomical object to another from the point of view of Earth. These objects may have been recorded and perhaps regarded based on what was observed. The gravity model of the North Atlantic ocean basin reveals tectonic history in sharp detail. Red dots show the location of past earthquakes of magnitude 5.5 or higher. Credit: David Sandwell, Scripps Institution of Oceanography. "In the latest map, as many as 20,000 previously unknown seamounts, between 1.5 and 2 kilometres high, pop into view scattered along relatively young sections of the sea floor." "The gravity model of the North Atlantic ocean basin [above] reveals tectonic history in sharp detail. [The red] dots show the [locations] of past earthquakes of magnitude 5.5 or higher." The 19 km-diameter (12 mi) circular Weaubleau structure is discernible in the drainage patterns of this shaded-relief image. Credit: . This is an aerial view of the Barringer Meteor Crater about 69 km east of Flagstaff, Arizona USA. Credit: D. Roddy, U.S. Geological Survey (USGS). This is a Landsat image of the Barringer Meteor Crater from space. Credit: National Map Seamless Server, NASA Earth Observatory. This is an image of the Canyon Diablo iron meteorite (IIIAB) 2,641 grams. Credit: Geoffrey Notkin, Aerolite Meteorites of Tucson, Geoking42. The Holsinger meteorite is the largest discovered fragment of the meteorite that created Meteor Crater and it is exhibited in the crater visitor center. Credit: Mariordo Mario Roberto Duran Ortiz. Aurora Borealis is photographed by NASA astronaut Donald R. Pettit. Credit: NASA. The figure shows a reconstruction of the North American (Laurentian) and Eurasian plate positions in the Northern Hemisphere of Earth 214 Myr ago (Mercator projection), with the locations of the five impact structures marked. Credit: John G. Spray, Simon P. Kelley & David B. Rowley. The Weaubleau structure is a probable meteorite impact site in western Missouri near the towns of Gerster, Iconium, Osceola, and Vista. It is believed to have been caused by a 1200-ft (366 m) meteoroid between 330 and 335 million years ago during the late Mississippian Period (Latest Osagean to Earliest Meramecian). It is listed by the Impact Field Studies Group as a "probable" impact structure. The structure consists of an area of severe structural deformity and extensive brecciation that was poorly understood and had been thought to be the result of either thrusting over a dome or a cryptoexplosive event. A 19-km-diameter (12 mi) circular structure was discovered ... through examination of digital elevation data. Because the site was covered by later Pennsylvanian Period sediments, and only partially exposed to erosion relatively recently, its structure is well preserved, and its age can be determined with fair accuracy. It is one of a series of known or suspected impact sites along the 38th parallel in the states of Illinois, Missouri, and Kansas. The Weaubleau structure is one of the fifty largest known impact craters on earth and the fourth largest in the United States. The three larger ones in the US either have been glaciated and buried (Manson crater), are under water (Chesapeake Bay crater), or have been subjected to orogeny (Beaverhead crater). Therefore the Weaubleau structure is the largest exposed untectonized impact crater in the US. In the image at left is an aerial view of the Barringer Meteor Crater about 69 km east of Flagstaff, Arizona USA. Although similar to the aerial view of the Soudan crater, the Barringer Meteor Crater appears angular at the farthest ends rather than round. "Meteor Crater is a meteorite impact crater approximately 43 miles (69 km) east of Flagstaff, near Winslow in the northern Arizona desert of the United States. Because the US Department of the Interior Division of Names commonly recognizes names of natural features derived from the nearest post office, the feature acquired the name of "Meteor Crater" from the nearby post office named Meteor. The site was formerly known as the Canyon Diablo Crater, and fragments of the meteorite are officially called the Canyon Diablo Meteorite. Scientists refer to the crater as Barringer Crater in honor of Daniel Barringer, who was first to suggest that it was produced by meteorite impact. From space the crater appears almost like a square. The image at right has a resolution of 2 meters per pixel, and illumination is from the right. Layers of exposed limestone and sandstone are visible just beneath the crater rim, as are large stone blocks excavated by the impact. The Holsinger meteorite is the largest discovered fragment of the meteorite that created Meteor Crater and it is exhibited in the crater visitor center. The Canyon Diablo meteorite comprises many fragments of the asteroid that impacted at Barringer Crater (Meteor Crater), Arizona, USA. Meteorites have been found around the crater rim, and are named for nearby Canyon Diablo, which lies about three to four miles west of the crater. There are fragments in the collections of museums around the world including the Field Museum of Natural History in Chicago. The biggest fragment ever found is the Holsinger Meteorite, weighing 639 kg, now on display in the Meteor Crater Visitor Center on the rim of the crater. At right is a natural color photograph of the Aurora Borealis or northern lights and the Manicouagan Impact Crater reservoir (foreground) in Quebec, Canada. They are featured in this photograph taken by astronaut Donald R. Pettit, Expedition Six NASA ISS science officer, on board the International Space Station (ISS). "Collisions by fragmented objects result in multiple impacts that can lead to the formation of linear crater chains, or catenae, on planetary surfaces2." "Five terrestrial impact structures have been found to possess comparable ages (214 Myr), coincident with the Norian stage of the Triassic period. These craters are Rochechouart (France), Manicouagan and Saint Martin (Canada), Obolon' (Ukraine) and Red Wing (USA). When these impact structures are plotted on a tectonic reconstruction of the North American and Eurasian plates for 214 Myr before present, the three largest structures (Rochechouart, Manicouagan and Saint Martin) are co-latitudinal at 22.8° (within 1.2°, 110 km), and span 43.5° of palaeolongitude. These structures may thus represent the remains of a crater chain at least 4,462 km long. The Obolon' and Red Wing craters, on the other hand, lie on great circles of identical declination with Rochechouart and Saint Martin, respectively. [...] the five impact structures were [likely] formed at the same time (within hours) during a multiple impact event caused by a fragmented comet or asteroid colliding with Earth." "Silicates are the dominant group minerals in the Earth's crust." "Tcs are dominated by the volumetrically dominant Group A grains in the pillow interior and are generally between 130 and 190°C (sub-samples d–l at depths of 1.5 to 6.2 cm from the rim"
Much of the use of dominant group relative to the Earth (rocky object) is described in dominant group/Geology. This is an artist's rendition of the deflection of high-energy particles around the Earth along magnetic field lines. Credit: ESA/ATG Medialab. This picture displays the changes in intensity of the Earth's magnetic field between January and June 2014. Credit: ESA/DTU Space. The graph shows a comparison of the observed magnetic profile for the seafloor across the East Pacific Rise against a profile calculated from the Earth's known magnetic reversals, assuming a constant rate of spreading. Credit: W. Jacquelyne Kious and Robert I. Tilling, USGS. The center part of the figure -- representing the deep ocean floor -- shows the magnetic striping mapped by oceanographic surveys offshore of the Pacific Northwest. Credit: W. Jacquelyne Kious and Robert I. Tilling, USGS. From "stone samples from the bottom of the Atlantic Ocean that the magnetic field of Earth changes its direction on average every 780,000 years. And the last polar reversal, the Brunhes-Matuyama-Reversal, happened some 780,000 years ago." "The Brunhes-Matuyama Reversal happened much faster than had been thought hitherto, as a team of scientists investigating a fossil lake in Italy recently found out. The change occurred in just about one hundred years." "In the past one hundred years, [the Earth's magnetic field, illustrated in the first image at right] has diminished globally by a good five percent. In some areas, such as the Atlantic before the coast of Brazil [as seen in the second image at the right], it has lost even more of its strength. In the area of this so-called South-Atlantic anomaly, a minus of five percent has been observed within a mere ten or fifteen years." "Almost as fast as during the short lived magnetic reversal 41,000 year ago, also known as the “geomagnetic excursion.” The magnetic North pole wandered within 200 years to the South pole, remained there for 440 years, then it moved back. These short excursions are even more frequent than the recurring long wanderings." The "processes [in the Earth’s deep interior] are responsible for over 95 percent of the strength of the magnetic field: around a solid core of iron and nickel, there is a zone in which the metal is in a liquid state. The solid interior core of the Earth and its liquid surroundings rotate with different speeds, while convection currents are forming in the liquid zone which move by about ten kilometres a year." The graph [at third right] shows a comparison of the observed magnetic profile for the seafloor across the East Pacific Rise against a profile calculated from the Earth's known magnetic reversals, assuming a constant rate of spreading. "An observed magnetic profile (blue) for the ocean floor across the East Pacific Rise is matched quite well by a calculated profile (red) based on the Earth's magnetic reversals for the past 4 million years and an assumed constant rate of movement of ocean floor away from a hypothetical spreading center (bottom). The remarkable similarity of these two profiles provided one of the clinching arguments in support of the seafloor spreading hypothesis." "A team of U.S. Geological Survey scientists -- geophysicists Allan Cox and Richard Doell, and isotope geochemist Brent Dalrymple -- reconstructed the history of magnetic reversals for the past 4 million years using a dating technique based on the isotopes of the chemical elements potassium and argon. The potassium-argon technique -- like other "isotopic clocks" -- works because certain elements, such as potassium, contain unstable, parent radioactive isotopes that decay at a steady rate over geologic time to produce daughter isotopes. The rate of decay is expressed in terms of an element's "half-life," the time it takes for half of the radioactive isotope of the element to decay. The decay of the radioactive potassium isotope (potassium-40) yields a stable daughter isotope (argon-40), which does not decay further. The age of a rock can be determined ("dated") by measuring the total amount of potassium in the rock, the amount of the remaining radioactive potassium-40 that has not decayed, and the amount of argon-40. Potassium is found in common rock-forming minerals, and because the potassium-40 isotope has a half-life of 1,310 million years, it can be used in dating rocks millions of years old." Rocks "generally belong to two groups according to their magnetic properties. One group has so-called normal polarity, characterized by the magnetic minerals in the rock having the same polarity as that of the Earth's present magnetic field. This would result in the north end of the rock's "compass needle" pointing toward magnetic north. The other group, however, has reversed polarity, indicated by a polarity alignment opposite to that of the Earth's present magnetic field. In this case, the north end of the rock's compass needle would point south. How could this be? This answer lies in the magnetite in volcanic rock. Grains of magnetite -- behaving like little magnets -- can align themselves with the orientation of the Earth's magnetic field. When magma (molten rock containing minerals and gases) cools to form solid volcanic rock, the alignment of the magnetite grains is "locked in," recording the Earth's magnetic orientation or polarity (normal or reversed) at the time of cooling." "As more and more of the seafloor was mapped during the 1950s, the magnetic variations turned out not to be random or isolated occurrences, but instead revealed recognizable patterns. When these magnetic patterns were mapped over a wide region, the ocean floor showed a zebra-like pattern. Alternating stripes of magnetically different rock were laid out in rows on either side of the mid-ocean ridge: one stripe with normal polarity and the adjoining stripe with reversed polarity. [And, in the Pacific Northwest, shown on the right in the fourth image.]] The overall pattern, defined by these alternating bands of normally and reversely polarized rock, became known as magnetic striping." The "Swarm" satellites have been flying around Earth since Fall of 2013. Credit: Christoph Seidler, ESA/DTU. This is an artist's sketch of the Shinkai 6500, a Japanese vessel that is currently the world's deepest-diving manned research submarine. Credit: Japan Marine Science & Technology Center. Alvin is a three-person, self-propelling capsule-like submarine nearly eight meters long. Credit: Woods Hole Oceanographic Institution. The Glomar Challenger was the first research vessel specifically designed in the late 1960s for the purpose of drilling into and taking core samples from the deep ocean floor. Credit: Ocean Drilling Program, Texas A & M University. The JOIDES Resolution is the deep-sea drilling ship of the 1990s. Credit: Ocean Drilling Program, Texas A & M University. "Three [Swarm] satellites of the European Space Agency (ESA) have measured the magnetic field of Earth more precisely than ever before." "Shinkai 6500, a Japanese research submarine built in 1989 [an artist's impression is on the left], can work at depths down to 6,400 m."
"Scientists discovered the hot-springs ecosystems with the help of Alvin [imaged on the right, third one], the world's first deep-sea submersible. Constructed in the early 1960s for the U.S. Navy, Alvin is a three-person, self-propelling capsule-like submarine nearly eight meters long. In 1975, scientists of Project FAMOUS (French-American Mid-Ocean Undersea Study) used Alvin to dive on a segment of the Mid-Atlantic Ridge in an attempt to make the first direct observation of seafloor spreading. No hot springs were observed on this expedition; it was during the next Alvin expedition, the one in 1977 to the Galapagos Rift, that the hot springs and strange creatures were discovered. Since the advent of Alvin, other manned submersibles have been built and used successfully to explore the deep ocean floor. Alvin has an operational maximum depth of about 4,000 m, more than four times greater than that of the deepest diving military submarine." "The Glomar Challenger [imaged on the third right] was the first research vessel specifically designed in the late 1960s for the purpose of drilling into and taking core samples from the deep ocean floor." "In the years following World War II, continental oil reserves were being depleted rapidly and the search for offshore oil was on. To conduct offshore exploration, oil companies built ships equipped with a special drilling rig and the capacity to carry many kilometers of drill pipe. This basic idea later was adapted in constructing a research vessel, named the Glomar Challenger, designed specifically for marine geology studies, including the collection of drill-core samples from the deep ocean floor. In 1968, the vessel embarked on a year-long scientific expedition, criss-crossing the Mid-Atlantic Ridge between South America and Africa and drilling core samples at specific locations. When the ages of the samples were determined by paleontologic and isotopic dating studies, they provided the clinching evidence that proved the seafloor spreading hypothesis." "The JOIDES Resolution [in the fourth image on the right] is the deep-sea drilling ship of the 1990s (JOIDES= Joint Oceanographic Institutions for Deep Earth Sampling). This ship, which carries more than 9,000 m of drill pipe, is capable of more precise positioning and deeper drilling than the Glomar Challenger." ↑ 2.0 2.1 2.2 "53319 (1999 JM8), In: Minor Planet Center". Retrieved 23 November 2017. ↑ 3.0 3.1 "JPL Small-Body Database Browser: 53319 (1999 JM8)" (2017-11-21 last obs.). Jet Propulsion Laboratory. Retrieved 23 November 2017. ↑ 4.0 4.1 4.2 "LCDB Data for (53319)". Asteroid Lightcurve Database (LCDB). Retrieved 23 November 2017. ↑ Carry, B.; Solano, E.; Eggl, S.; DeMeo, F. E. (April 2016). "Spectral properties of near-Earth and Mars-crossing asteroids using Sloan photometry". Icarus 268: 340–354. doi:10.1016/j.icarus.2015.12.047. http://adsabs.harvard.edu/cgi-bin/bib_query?bibcode=2016Icar..268..340C. Retrieved 23 November 2017. ↑ Brozovic, M.; Benner, L. A. M.; Nolan, M. C.; Ostro, S. J.; Margot, J. L.; Giorgini, J. D.; Howell, E. S.; Magri, C. et al. (May 2012). "Shape Modeling of Near-Earth Asteroid (53319) 1999 JM8 from Goldstone and Arecibo Radar Images". Asteroids. http://adsabs.harvard.edu/cgi-bin/bib_query?bibcode=2012LPICo1667.6183B. Retrieved 23 November 2017. ↑ Pravec, P.; Harris, A. W.; Scheirich, P.; Kusnirák, P.; Sarounová, L.; Hergenrother, C. W. et al. (January 2005). "Tumbling asteroids". Icarus 173 (1): 108–131. doi:10.1016/j.icarus.2004.07.021. http://adsabs.harvard.edu/cgi-bin/bib_query?bibcode=2005Icar..173..108P. Retrieved 23 November 2017. ↑ Benner, L. A. M.; Nolan, M. C.; Margot, J.-L.; Giorgini, J. D.; Hudson, R. S.; Jurgens, R. F. et al. (May 2001). "Recent Radar Observations of Four Near-Earth Asteroids". American Astronomical Society 33: 918. http://adsabs.harvard.edu/cgi-bin/bib_query?bibcode=2001AAS...198.8907B. Retrieved 23 November 2017. ↑ Reddy, Vishnu; Gaffey, Michael J.; Abell, Paul A.; Hardersen, Paul S. (May 2012). "Constraining albedo, diameter and composition of near-Earth asteroids via near-infrared spectroscopy". Icarus 219 (1): 382–392. doi:10.1016/j.icarus.2012.03.005. http://adsabs.harvard.edu/cgi-bin/bib_query?bibcode=2012Icar..219..382R. Retrieved 23 November 2017. ↑ Benner, L. A. M.; Ostro, S. J.; Nolan, M. C.; Margot, J.-L.; Giorgini, J. D.; Hudson, R. S. et al. (November 2001). "Radar Observations of Asteroid 1999 JM8". American Astronomical Society 33: 1153. http://adsabs.harvard.edu/cgi-bin/bib_query?bibcode=2001DPS....33.6106B. Retrieved 23 November 2017. ↑ Benner, Lance A. M.; Ostro, Steven J.; Nolan, Michael C.; Margot, Jean-Luc; Giorgini, Jon D.; Hudson, R. Scott et al. (June 2002). "Radar observations of asteroid 1999 JM8". Meteoritics and Planetary Science: 779–792. doi:10.1111/j.1945-5100.2002.tb00855.x. http://adsabs.harvard.edu/cgi-bin/bib_query?bibcode=2002M&PS...37..779B. Retrieved 23 November 2017. ↑ "MPC/MPO/MPS Archive". Minor Planet Center. Retrieved 24 February 2018. ↑ 13.0 13.1 J. M. Watson (24 June 1999). Exploring the deep ocean floor: Hot springs and strange creatures. Reston, Virginia USA: U. S. Geological Survey. Retrieved 2014-10-26. ↑ fault. San Francisco, California: Wikimedia Foundation, Inc. Retrieved 2014-10-27. ↑ 15.0 15.1 Warren Wiscombe (19 July 2009). Mount Tambora Volcano, Sumbawa Island, Indonesia. NASA Earth Observatory. Retrieved 2013-03-30. ↑ Glossary of Terms: C. physicalgeography.net. Retrieved 2008-04-12. ↑ Rosaly Lopes (2005-02-07). The Volcano Adventure Guide. Cambridge University Press. p. 153. ISBN 978-0-521-55453-4. ↑ 19.0 19.1 Ulrich, G E. SP Mountain cinder cone and lava flow, northern Arizona (PDF). Geological Society of American Centennial Field Guide – Rocky Mountain Section 1987. pp. 385–8. ↑ Basksi A, K. "K-Ar study of the S.P. flow". Canadian Journal of Earth Sciences 1974 11: 1350–1356. http://www.nrcresearchpress.com/doi/abs/10.1139/e74-131. ↑ Duffield, Wendell A; Riggs, Nancy; Kaufman, Darrell; Champion, Duane; Fenton, Cassandra; Forman, Steven; McIntosh, William; Hereford, Richard; Plescia, Jeffrey; Ort, Michael. "Multiple constraints on the age of a Pleistocene lava dam across the Little Colorado River at Grand Falls, Arizona". Geological Society of America Bulletin 118 (3-4): 421-9 2006. https://www.researchgate.net/profile/Steven_Forman2/publication/249527393_Multiple_constraints_on_the_age_of_a_Pleistocene_lava_dam_across_the_Little_Colorado_River_at_Grand_Falls_Arizona/links/574a1a2108ae2e0dd30188b9.pdf. ↑ A.R. Hildebrand, J.A. Stansberry (March 1992). "K/T boundary ejecta distribution predicts size and location of Chicxulub crater". Abstracts of the Lunar and Planetary Science Conference 23 (03): 537. http://adsabs.harvard.edu/full/1992LPI....23..537H. Retrieved 2013-10-18. ↑ P. Ma, K. Aggrey, C. Tonzola, C. Schnabel, P. de Nicola, G.F. Herzog, J.T. Wasson, B.P. Glass, L. Brown, F. Tera, R. Middleton, J. Klein (October 2004). "Beryllium-10 in Australasian tektites: constraints on the location of the source crater". Geochimica et Cosmochimica Acta 68 (19): 3883-96. http://www.sciencedirect.com/science/article/pii/S0016703704002741. Retrieved 2013-10-18. ↑ Carey Sublette. The Effects of Underground Explosions. Nuclear Weapon Archive. Retrieved 21 June 2011. ↑ 27.0 27.1 27.2 27.3 27.4 Kerry Sieh (31 January 2012). Long Valley Caldera Field Guide - Panum Crater. USGS. Retrieved 2013-03-30. ↑ Gregory Insarov & Irina Insarova (1995). "The lichens of calcareous rocks in the Central Negev, Israel". Israel Journal of Plant Sciences 43 (1): 53-62. doi:10.1080/07929978.1995.10676590. http://www.tandfonline.com/doi/abs/10.1080/07929978.1995.10676590. Retrieved 2013-10-16. ↑ 30.0 30.1 N. Fruchter, A. Matmon, Y. Avni, D. Fink (November 15, 2011). "Revealing sediment sources, mixing, and transport during erosional crater evolution in the hyperarid Negev Desert, Israel". Geomorphology 134 (3-4): 363-77. http://www.sciencedirect.com/science/article/pii/S0169555X11003564. Retrieved 2013-10-16. ↑ US Geological Survey. Iowa Meteorite Crater Confirmed. Retrieved 7 March 2013. ↑ 35.0 35.1 35.2 35.3 35.4 35.5 35.6 Heidi Koontz and Robert McKay (March 5, 2013). Iowa Meteorite Crater Confirmed. 12201 Sunrise Valley Dr, MS 119 Reston, Virginia 20192 USA: U.S. Geological Survey. Retrieved 2013-03-30. ↑ 36.0 36.1 Henry J. Moore (1976). Missile impact craters (White Sands Missile Range, New Mexico) and applications to lunar research: Contributions to astrogeology (PDF). Washington, DC USA: USGS. Retrieved 2014-06-13. ↑ Lars Stixrude; Evgeny Waserman and Ronald Cohen (November 1997). "Composition and temperature of Earth's inner core". Journal of Geophysical Research (American Geophysical Union) 102 (B11): 24729–24740. doi:10.1029/97JB02125. http://www.agu.org/pubs/crossref/1997/97JB02125.shtml. ↑ Jason Major (7 June 2013). What Does Antarctica Look Like Under the Ice?. Universe Today. Retrieved 2015-01-08. ↑ Michael Studinger (7 June 2013). What Does Antarctica Look Like Under the Ice?. Universe Today. Retrieved 2015-01-08. ↑ 40.0 40.1 David Sandwell (2 October 2014). Gravity map uncovers sea-floor surprises. Nature.com. Retrieved 2014-10-02. ↑ Miller, J.F., Evans, K.R., Rovey, C.W., II, Ausich, W.L., Bolyard, S.E., Davis, G.H., Ethington, R.L., Sandberg, C.A., Thompson, T.L., and Waters, J.A., Mixed-age echinoderms, conodonts, and other fossils used to date a meteorite impact, and implications for missing strata in the type Osagean (Mississippian) in Missouri, USA. Echinoderm Paleobiology, 2008, 53p. ↑ David Rajmon (2009-07-01). Impact database 2009.1. Retrieved 2009-08-25. ↑ Snyder, F.G., Gerdemann, P.E., Hendricks, H.E., Williams, J.H., Wallace, G., and Martin, J.A., 1965, Cryptoexplosive structures in Missouri: Guidebook, 1965 Annual Meeting of the Geological Society of America: Missouri Geological Survey and Water Resources, Report of Investigations No. 30, 73 p.
↑ Grieve, R.A.F. (1990) Impact Cratering on the Earth, Scientific American 262(4), 66–73. ↑ 48.0 48.1 John G. Spray, Simon P. Kelley & David B. Rowley (12 March 1998). "Evidence for a late Triassic multiple impact event on Earth". Nature 392 (6672): 171-3. doi:10.1038/32397. http://www.nature.com/nature/journal/v392/n6672/abs/392171a0.html. Retrieved 2014-08-06. ↑ Weiming Zhou, Rob Van der Voo, Donald R Peacor, Youxue Zhang (June 2000). "Variable Ti-content and grain size of titanomagnetite as a function of cooling rate in very young MORB". Earth and Planetary Science Letters 179 (1): 9-20. doi:10.1016/S0012-821X(00)00100-X. http://www.sciencedirect.com/science/article/pii/S0012821X0000100X. Retrieved 2012-02-10. ↑ 51.0 51.1 51.2 Christoph Seidler, translated by Anne-Marie de Grazia (19 June 2014). Earth's weakening magnetic field. Q-Mag.org. Retrieved 2014-10-21. ↑ 52.0 52.1 52.2 Holger Dambeck, translated by Anne-Marie de Grazia (19 June 2014). Earth's weakening magnetic field. Q-Mag.org. Retrieved 2014-10-21. ↑ 53.0 53.1 53.2 53.3 53.4 53.5 53.6 53.7 53.8 jmwatson (5 May 1999). Magnetic stripes and isotopic clocks. Reston, Virginia USA: U.S. Geological Survey. Retrieved 2014-10-23. This page was last edited on 24 January 2019, at 00:44.